Who’s the best driver in the world: Rally star Sébastien Ogier or F1 champion Lewis Hamilton? Trick question. Both are viable contenders, but only for a given value of “best”. Their driving styles are worlds apart. F1 is a matter of speed, precision and perfect understanding of the vehicle. A rally champion may not hit the same raw m.p.h., but they need to drive with flamboyance and a will to improvise. So it goes with many things - including sales and marketing. It’s understandable that business leaders put a premium on sales. You can’t get far without revenue, so from the outset companies look for the clients, contracts and projects that will inject immediate cash onto the P&L. For that reason, the sales function is one of the first things businesses set up, whether that’s the business leaders doing the work themselves, or whether it’s hiring one or two people to drive biz dev activity. Sales is also appealing in its simplicity. A salesperson’s work is tangible and easy to track: You contacted x number of prospects, it took you x amount of time, you landed us x number of contracts worth...x. The numbers are immediate, and reports don’t require much work to decipher. Similarly, sales offers a direct route out of potential financial troubles. If it looks like you’re going to miss quarterly targets, a big sales push (if done well) will herald a quick bump to your bottom line. If profits are slowing, an investment in sales seems like the obvious solution. Now consider these issues through a marketing lens. If you’re struggling to meet a quarterly target, will a considerable spend on brand get you over the line? Not likely. If you need to win a big contract this month, will an investment in market research help? Clearly not. Marketing can get short term results - a quick nurture campaign or a special promotion - but business owners' default setting is usually to plough more into sales. They often see the marketing function as a ‘cherry on top’: an unnecessary cost as opposed to the crucial strategic business function it really is. Make no mistake, a business can only grow to a certain size based on sales alone. All companies, sooner or later, encounter the kind of barriers to growth that marketing can help them overcome. At that point, they need a different type of expertise to pure salesmanship. No matter how good their sales director is, they need to invest in marketing sooner or later. But does that investment have to mean another director, or can your key salesperson take hold of the marketing reins? This ‘set-em-up’, ‘knock-em-down’ dynamic is so intrinsically linked, that getting one person to think about the whole process from start to finish might seem like a good idea. Sadly, in our experience, combined Sales and Marketing Directors rarely work. While they’re both results-oriented, customer-focused positions, good salespeople and good marketers have very different psychological perspectives. Good salespeople focus on the short to medium term. They like a quick fix, a swift hunt - they live in the moment, and they’re always closing. Good marketers think in the medium and long term. In the medium term, they nurture prospective customers and set up the pipeline for sales. They also have a strategic focus on long-term efforts. Sales strategy has undoubtedly changed over the last decade, but the mentality hasn’t. Good salespeople are still focused on immediate wins and the bottom line. And that’s a very good thing; you need that mindset in sales. The problem comes when you try to apply the same thinking to marketing. The real issue with a combined sales and marketing director is that you’re asking one person to think in two ways at the same time: focused and analytical, but also reactive, transactional and results-driven. It goes beyond asking someone to change their hat - you’re asking them to change their entire head. Sales Directors look at everything through a sales lens. Ask them to direct your marketing efforts, and they’ll assess success in exactly the same way. What that means is either they’ll focus all their attention on high-volume, short-term marketing tactics, like PPC or yellow pages ads where the role of marketing gets relegated to that of a lead generation machine. Or long-term marketing strategies like brand development or content marketing fall by the wayside after a month because they haven’t seen results. Marketing requires deep strategic thought to ascertain the best course of action for the business - whether that’s product development, pricing, routes to market or customer retention. 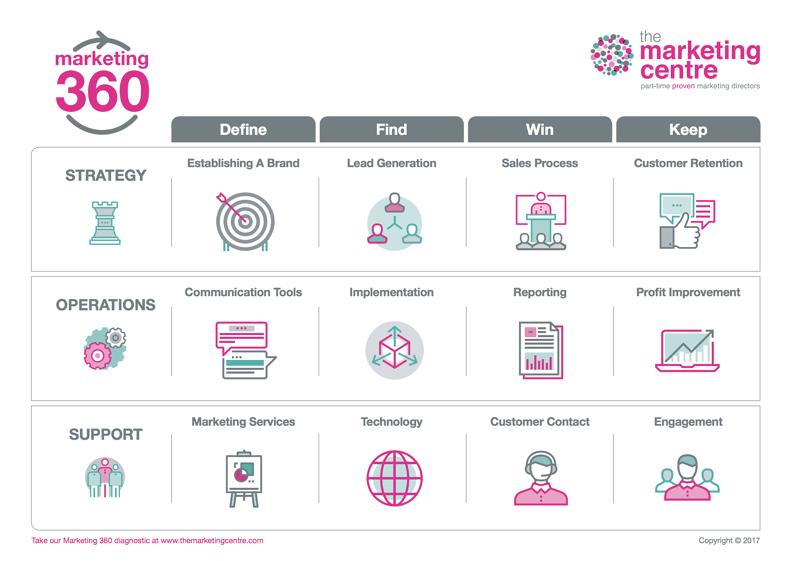 As Peter Drucker, the father of business consulting, said: “[Marketing] is the whole business seen from the point of view of the final result, that is, from the customer’s point of view." It covers areas that sales simply isn’t concerned with. It requires a different mindset from sales, and a different person in charge. Of course, this split comes with its own challenges. Marketing and sales may be very different disciplines requiring different personalities, but they’re still indelibly connected. Without marketing and sales alignment, you’ll be sat in the middle of the road, going nowhere fast. But this doesn’t mean having one person doing both roles, it means choosing marketing and sales directors that can work well together and collaborate. The bottom line: Good strategists are seldom good tacticians. Good players are seldom good coaches. And good salespeople are seldom good marketers. You need both skill sets to ensure your business hits its short and long term targets, and grows its profits and its market presence at a sustainable rate. Would you invite your Marketing Director to your Christmas do? At this time of year, there are three words that bring a strange mix of joy and trepidation to any UK worker that hears them…Office. Christmas. Party.